Even if we learned some useful things about our router (and in the next posts, we will continue to explore it), we still need to find the credentials to access to the interface. The interface is available via http or https and telnet, on the external interface – you can access it only from the local network, but you need to use the external ip address of the router. But how can we find the username / password? Well, when Fastweb started delivering those boxes, they left the default values of admin / admin – guessing that was easy, and everyone was happy :) But the fun didn’t last long – they quickly remotely upgraded the firmware, changing the password and stopping the joy. 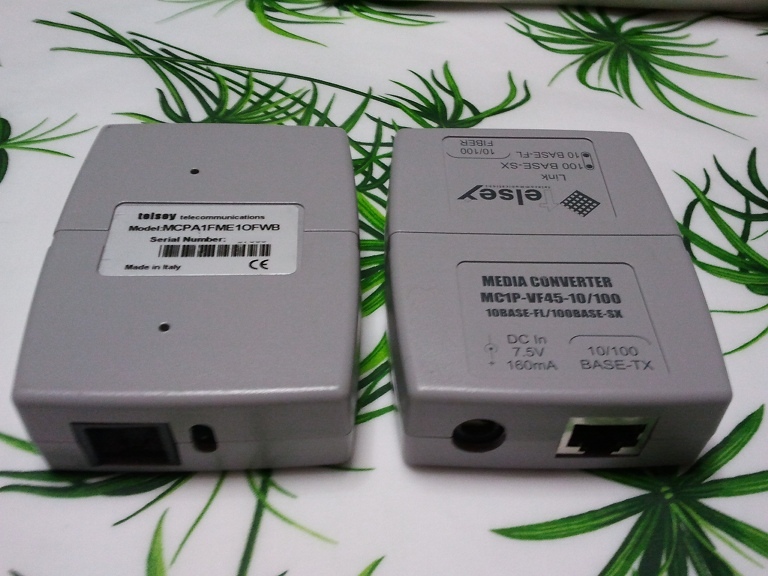 They are media converters – the media converter it’s the link between optical fiber and twisted pair. A couple of those, an hub, Wireshark, and we have the perfect setup to do Man In The Middle! The plan is simple: we start to sniff packets between the router and the Fastweb infrastructure, then we reset the router configuration (keeping pressed the reset pushbutton for about 15 sec), and… yes! We get the configuration file! Luckily, in OpenRG the password is obfuscated (and not encrypted! ), and we can deobfuscate it with Zibri’s OpenRG deobfiscator. Bingo! Yes… they didn’t learn anything. Another problem … in theory to access the WAN, you must set the IP address from which you access with a PC in a static way because, in my opinion, the Fast MAN, there is no active DHCP … so what would be the IP and mask address ? Hi iulius, I’d like do keep english as main blog language, but if you feel uncomfortable with that we can switch to italian. Anyway, the mediaconverters came with an old small business Fastweb contract: sadly I haven’t been unable to find them elsewhere – and apparently almost only Fastweb is using the 3M system. I’m not sure I understood correctly – now http and https ports are closed on the external ip addresses (WAN, MAN)? I think that, if this is the case, the best way would be to use the serial port header – at the end of the boot, you can login and configure the router via shell. I think that the media converter method is somewhat impraticable. So if you tried to enter the WAN side (the VF45) you can not login? I thought that could be done. Frankly I didn’t try, but I’m fairly sure that is unaccessible. Reading the configuration, the only allowed access from outside is via telnet, and only for selected networks. Out of curiosity, when did you notice this “update”? I’ll try to do a post with some info to harden the router – only disabling TR-069 didn’t work for me either (when the username / password was admin / admin). I looked for the media converters you used but I cannot find them anywhere. Since I am looking for getting rid of that router I was wondering if it was possibile to use a media converter and an ethernet router to substitute the elsa. Now I am trying to find a way to convert the terrible 3M VF-45 connector to something common like SC or LC so I can use common media converters. Panda, did you succeed? I would also love to replace the Argo with a converter and use my own router. Prima di tutto grazie per la tua guida: la seguii 4 anni fa riuscendo a sbloccare il mio argo di allora, ma poi per motivi tecnici, un anno e mezzo fa me lo hanno sostituito perchè morto… dandomi un altro argo lasciato intatto. Da allora l’ho tenuto stock, ed ora volevo muovermi per una modifica un po’ più radicale: rimuovere l’ARGO e sostituirlo con un router mio. – Se l’autonegoziazione della velocità è attiva, la spia attività lato ethernet continua a lampeggiare, se la spengo settando a mano la velocità, vedo purtroppo la spia della velocità impostata che fissa, ogni 10 secondi si spegne ed accende, ma per il dispositivo ethernet la porta rimane DOWN. Inutile dire che ho modificato il mac address, ho settato gli ip esterno e MAN, ma purtroppo non ne sono venuto a capo. Se collego invece il media conv alla porta fibra dell’argo, la porta ethernet va up e riesco a vedere l’argo con il suo ip MAN. Volevo quindi approfittarne per chiederti se avevi avuto modo di fare queste prove, avendo tu più esperienza e più materiale a disposizione, per capire se questo swap è possibile o se l’argo effettua delle operazioni di autenticazione particolari che non conosciamo, anche se a me ad occhio sembrano più problemi di mancata negoziazione.